NEWA offers 23 different fruit and vegetable models and all use real-time weather data to generate research-based crop guidelines for growers in New York State and beyond. Extension specialists across the state provide expertise in different commodity areas and are available to provide management expertise and consultation regarding the utilization of NEWA guidelines on your farm. Use this guide to locate a fruit or vegetable specialist in your region of New York. Click the hyperlinks to learn more about a specific NEWA model, extension program, or commodity specialist. Apple diseases. Fire blight, apple scab, sooty blotch fly speck. Apple insects. Apple maggot, codling moth, obliquebanded leafroller, oriental fruit moth, plum curculio, San Jose scale, spotted tentiform leafminer. Apple management. Blossom thinning, carbohydrate fruit thinning, irrigation modeling. Grape diseases. Black rot, phomopsis, powdery mildew, downy mildew. Vegetable diseases. Onion diseases, potato diseases, tomato diseases. Vegetable insects. Cabbage maggot, onion maggot. This entry was posted in About NEWA, learning and tagged consultation, expertise, local, new york, NEWA, specialist on March 19, 2019 by Dan Olmstead. This is part five in a five-part blog series discussing 2017 NEWA survey results of users and non-users. Download the full report to learn more. Survey participants self-identified as NEWA users were asked to share final comments regarding NEWA and ways the platform could be improved in the future. Of the 71 people responding to this question, 23 (32%) stated that NEWA was excellent and thanked us for NEWA. For detailed analysis, download the 2017 NEWA survey. Results of the 2017 NEWA survey contain a trove of data and information. Final recommendations, based on this information include the following points of importance. At workshops and conferences, promote the high level of trust and reliability growers have in NEWA to categorize pest risk and provide IPM recommendations. Raise awareness among growers that using NEWA can result in better spray timing, significant savings on spray bills, and improved crop protection. A promotion and awareness campaign for NEWA vegetable models and extension education on how to use them is needed, because vegetable production is significant throughout NEWA’s region — however, reported usage is low. A coordinated effort is needed to develop online educational resources for new and existing NEWA users that can be used independently and in workshops and presentations. A well-executed awareness campaign can reach new audiences and should bring new users to NEWA resources, and encourage them to start using the platform. To expand and enhance NEWA, focus on and recruit future development in the areas of vegetable, ornamental, and field crop production and pest forecast models. Because NEWA weather data products are valued and accessed by all users, develop innovative weather products to attract future NEWA users. This entry was posted in 2017 NEWA user survey, news and tagged 2017, conclusions, NEWA, NYS IPM, survey on January 14, 2019 by Dan Olmstead. This is part four in a five-part blog series discussing 2017 NEWA survey results of users and non-users. Download the full report to learn more. In the 2017 NEWA survey, participants were asked about NEWA resources used in the prior 12 months. These were organized into categories of weather data, apple, grape, vegetable, crop management, and ‘other’ resources. All products were chosen as having been used at similar levels (n=178): degree day tables (70%), daily summaries (67%), hourly data tables (52%), and a degree-day calculator (49%) — only recently developed for NEWA. 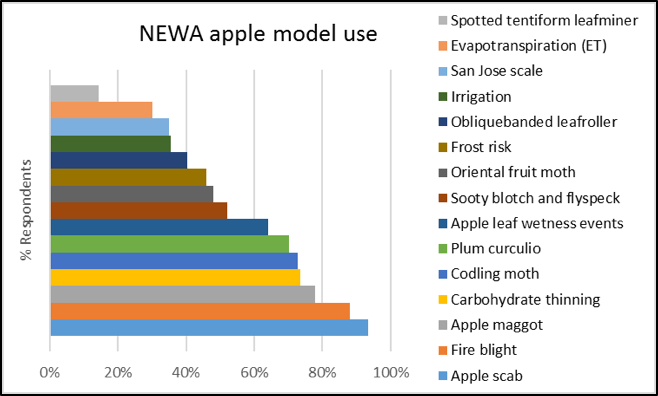 Apple scab, fire blight, apple maggot, codling moth, plum curculio and the apple carbohydrate thinning models were indicated as used most frequently by respondents (Fig. 1). Use percentages were based on the number of respondents to the model use questions for diseases, insects, and crop management, which were 92, 77, and 76, respectively. Figure 1. NEWA apple insect and disease model use among current users polled in a 2017 survey. All five grape tools were used at similar frequency among grape growers responding to these questions (n=72): grape berry moth 93%, black rot 83%, powdery mildew 82%, downy mildew 82%, and Phomopsis leaf and cane spot 79%. Fewer vegetable than fruit models are available on NEWA. Cabbage maggot and onion maggot models are popular among growers (Fig. 2). Use percentages were based on the number of respondents to disease and insect model questions, which were 35 and 20, respectively. NEWA vegetable tool development is an area for future growth. In addition, promotion and education on how to use existing vegetable tools would increase use. Figure 2. 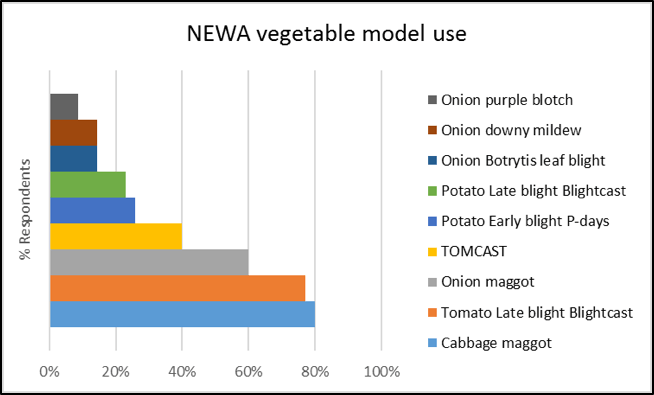 NEWA vegetable insect and disease model use among current users polled in a 2017 survey. NEWA provides outbound links to other tools and 39% of users access these. Most popular are weather information links such as NOAA radar maps and USDA drought maps, and national platforms such as the late blight USABlight and the iPIPE for Cucumber Downy Mildew. The Stewart’s wilt of sweet corn risk map and the turfgrass disease risk tool were used by very few survey respondents, four and three, respectively. Recent technological advances will allow better integration of these resources and should be considered for development within the NEWA platform. This entry was posted in 2017 NEWA user survey and tagged 2017, NEWA, NYS IPM, survey on December 17, 2018 by Dan Olmstead. Spam free zone. NEWA does not share or sell user information.